Oprah's last show is today. I watched her two-part farewell concert, and it definitely made me stop and think about what a positive impact she has had on the world. It's going to be sad watching the final episode, but I am looking forward to seeing who her final guest is, and what she has to say as she signs off. I know that since she's a black woman who is also a gagillionaire, there is probably lots to be said when it comes to race and inequality, and how they relate to Oprah's life. But that is not what I wanted to talk about today. Instead, I wanted to share something great that I learned recently from watching her show. Not as potentially life changing as the advice "don't let an attacker take you to a second location," but a nice bit of knowledge nonetheless. First, you should click here. If you're not one for doing what people tell you to do (or couldn't watch the video for some reason,) above was a clip about a man named George Dawson. He was a grandson of a slave and learned to read when he was 98! He also wrote a book after he learned to read called Life is So Good. Basically, he sounds like he was an all-around pretty cool guy. What was remarkable in terms of this post was that Mr. Dawson had a school named after him. Well, that is not that remarkable-- there are probably many schools named after black people. What is really the remarkable thing is that it was a school that was made up of predominantly white students. Typically, when there is something honoring a person of color, it is in a neighborhood that is populated primarily by people of that same race. Like the joke about all the Martin Luther King Boulevards being where the black people live. It is refreshing to see a break from this pattern, and white children learning about a great man that wasn't white. I would like to see this sort of thing more often, because if we have people who have truly done things that are worth celebrating, they should be celebrated by all of us, not just those of us who look like the person being celebrated. Oprah's last show is coming on in 45 minutes. And as much as she bugs me sometimes, I can bet money that I am going to cry. I hope that as we are all witness to this end of an era, we can continue to be inspired by the great things that she has done, and the unforgettable guests that we have seen on her show. And...how long do you think it will be before we see some Oprah Winfrey High Schools? No joke, as I was watching the Oprah finale today, I thought to myself, "I wonder if myblackfriend will blog about this?" George Dawson sounds like an amazing person. I'm glad there is a school named after him. So what did she say and who was her last guest? There were some crazy thunderstorms and tornado warnings and I was hiding in the basement with the kids.....the basement barely has electricity. No radio, no television. Just a couple of overhead lights and the only outlets are the ones the dryer and washing machine are plugged into. ....anyway, She said something when I was somewhere in the neighborhood of 10?? that struck a chord with me and still resonates within me today. I'm going to paraphrase because I don't remember the direct quote the show was about criminals and how pedophiles get less time than people who rob banks and how federal law says that even if NO gun is displayed or threatened that person will get a mandatory jail sentence without parole for x amount of time. Oprah said something like "America needs to start showing that they care about their children more than they care about their money"
Great post, DeAnna. What an amazing woman Oprah is and what an amazing man George Dawson was. If it wasn't for Oprah I probably never would have heard about Mr. Dawson. I will miss her dearly but will always remember all of the amazing stories and people she brought to us. 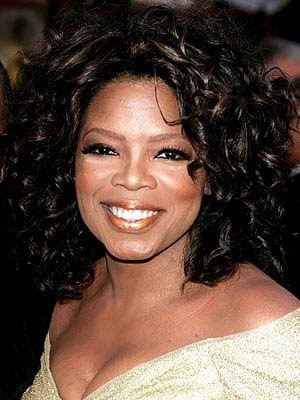 Actually, Oprah did not air today (where I live) due to all the tornadoes and severe weather. The meterologists were all blabbing and I was in the basement with the kids the entire time. It will air tomorrow at its 'normal' time. So what did she sign off saying? I am glad you posted this. It is encouraging to see America honoring black people in white neighborhoods. It is a step in the right direction. We need more of them.